to discerning individuals and companies. Put our experience to work for your portfolio. COMPASS will work closely with you to understand your needs and objectives in order to create an appropriate wealth plan. We see this process as interactive—we go through the process together and we explain the rationale for our recommendations, which are articulated in an understandable manner. We encourage your questions. As your needs change, we modify your wealth plan and investments to ensure that your financial assets are appropriately positioned. At our first meeting, we will take care to learn about you and your goals. We can meet with you at your home or office, at a time that is convenient for you. COMPASS strongly believes that the key to your long-term financial success is establishing a relationship of trust and ongoing dialogue with us. Based upon our conversations and information supplied by you, we jointly identify and define your lifestyle objectives, long-term financial needs, and personal goals. 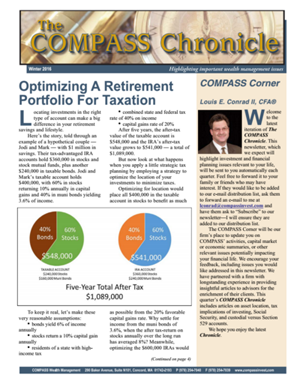 COMPASS then designs a customized and diversified investment strategy that balances your objectives with your risk tolerance. Our disciplined investment approach is centered on asset allocation and diversification—this approach limits risk while seeking superior returns. Your goals and objectives, your investment time horizon, and your risk profile dictate how we allocate and diversify your assets. Depending upon your portfolio's size, we select mutual funds and exchange-traded funds or separate accounts appropriate for your circumstances. Your investment portfolio gains the advantage of our industry contacts and access to money managers. We make informed decisions about your portfolio's holdings—information to which many are not privy. To ensure quality, we select only investment managers who meet our strict criteria for superior and consistent performance. We diligently monitor ongoing developments and make prudent adjustments as necessary. 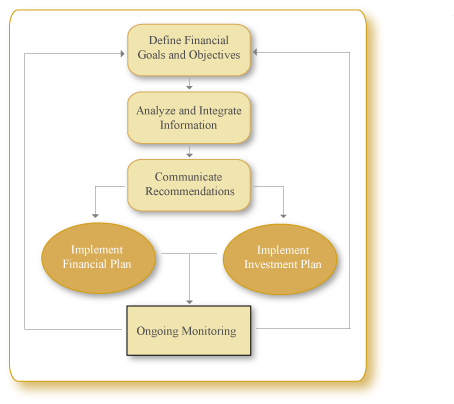 Once your financial goals have been established, financial planning issues that arise are addressed accordingly. Retirement planning is one such area. In consultation with you, we gather the necessary information and then prepare a detailed retirement plan. Your plan will include determining the likelihood that you will have sufficient assets for your retirement. We will also provide you with recommendations to improve your chances for a financially secure retirement. If you would like to assist your children or grandchildren with their future educational expenses, then we will design a strategy to meet that goal. The strategy will include the selection of the best educational savings vehicle to meet the need, as well as how much you will likely need to save. In addition to retirement planning and education funding, our financial planning services include stock option planning, budgeting, and gift planning, as well as business succession planning, insurance, tax, and estate planning strategies. While we work with you in developing strategies to pursue in the areas of insurance, tax, estate planning, and business succession planning, we can provide you with referrals to the appropriate professionals if further assistance is necessary in those areas.